Be warned, this guide is not for the faint of heart! BUT! 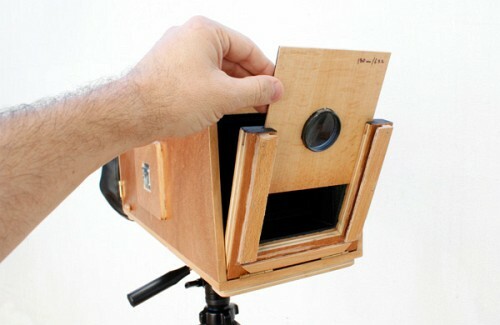 it will be one of the most rewarding projects you’ll ever make, granting you with a camera you built yourself that takes real pictures onto real photo paper. And before anyone jumps, we covered all the parts and all the needed steps, and while it is pretty detailed, it is not an super precise plan (just like the battleship) and we assume you know some basic staff. so feel free to expand it into something of your own. 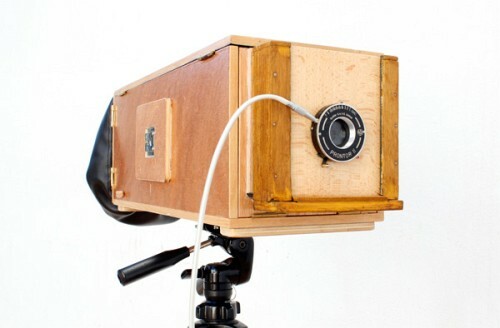 Photography has evolved immensely over the past years, in fact it was only a few decades back when we took pictures using a glass frame (and by we, I mean professional photographer, cuz no one could afford to get a personal 3 feet camera box). than we advanced onto large films, smaller films and now digital. Of course that with the change of format, change of how we expose, change of how we develop and change in how we print, the resulting image has changed quite a bit. 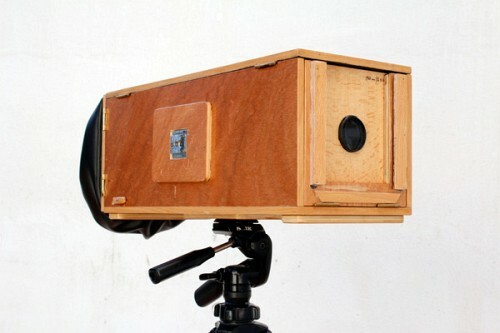 This project builds a modern old camera, the kind of box you would use to expose big pieces of negative or paper. Are the results perfectly sharp? no! but that imperfection is part of the point. Celebrate it! 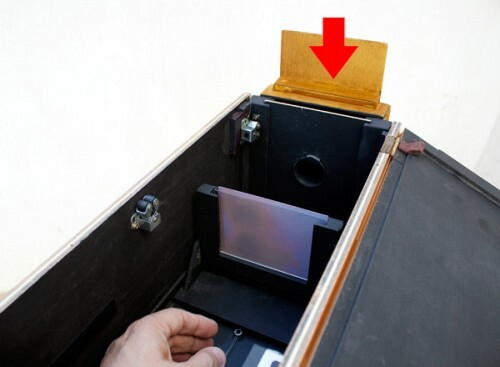 Here is where the limitation lies: with large format cameras, the negatives are stored on cartridges, where each cartridge holds two sheets of film. That means that to take 10 photos you’d have to carry 5 cartridges. Tedious. My design got rid of this and allows for up to 50 pictures to be taken on a single load (all automatically protected from stray light while not exposed). I also wanted to be able to use different focal lengths with the body, so that had to be taken care of too. Here is how it was done. Bear in mind that while I go practically step by step on this one, you don’t have to follow the footsteps exactly. In fact, I encourage you to change, mod and experiment with your own designs. 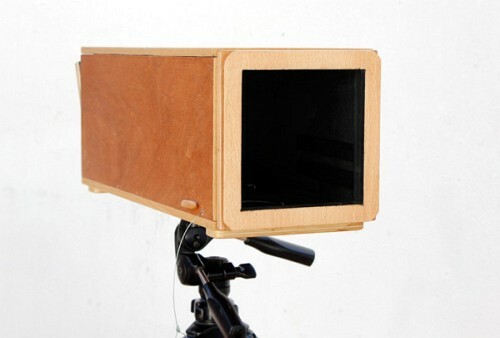 The camera is basically a square box. It is 19x19x48 cm big. I know you think it is too long, that length is there to allow for focusing on multiple focal lengths and to store all the necessary light sensitive materials. 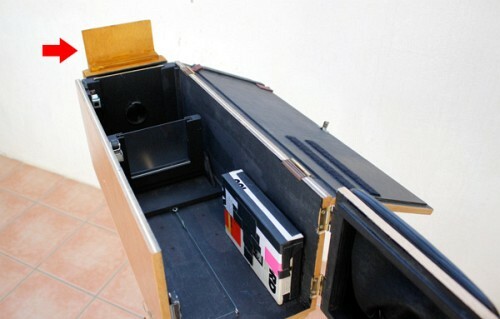 The interior is black and every removable part is equipped with a light trap so no light enters the body. 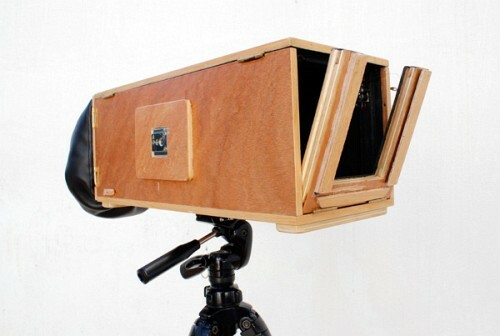 This is how the camera looks open. lots of parts, I know. We’ll go through them all. 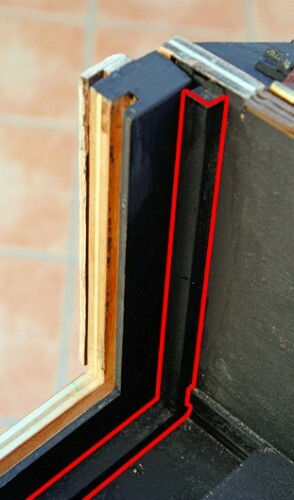 The red lines show how the light trap was made. 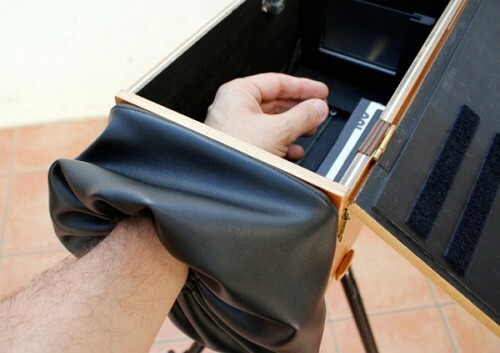 The back light blocking part is made from black synthetic leather and is basically a sleeve that has elastic band on both ends. 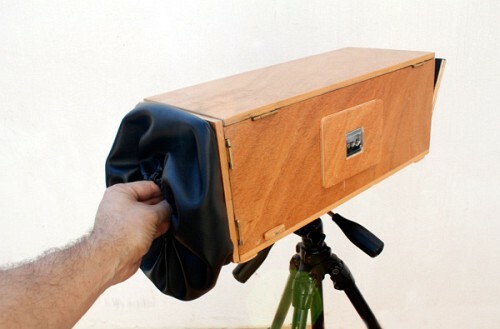 I know, usually those cameras have a huge black cover that you can literally go under, but the smaller sleeve allows easily viewing the focusing screen, sticking a hand in to handle the film without the inconvenience of handling the bigger screen. 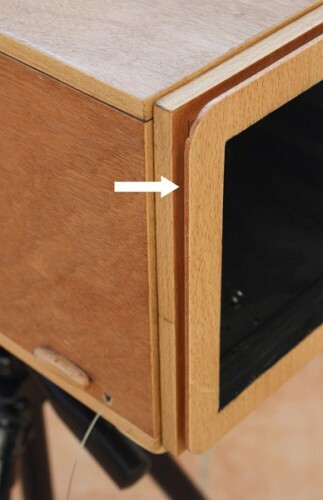 The wooden part of the back is made to hold that sleeve in place without allowing any light in. 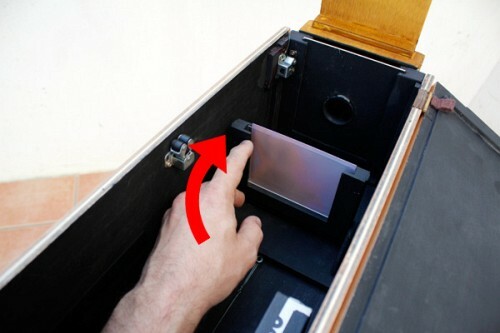 It is hinged to allow comfortable access for changing film while the camera is not in use. 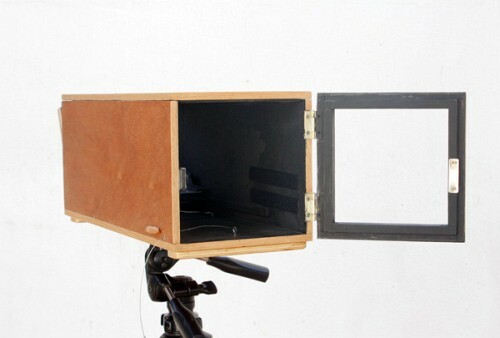 The front panel is the panel that holds the shutter and lens (and an optional filter if desired). 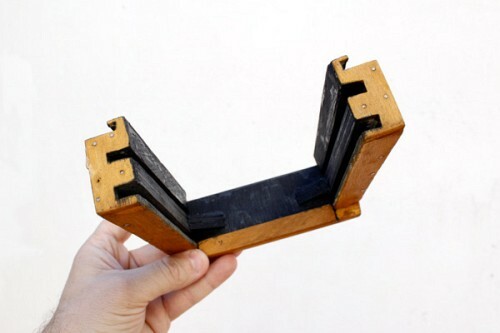 It is a U shaped rail system that holds wooden panel of 15×12 cm. Each of those carries a lens, a shutter to another mechanism. 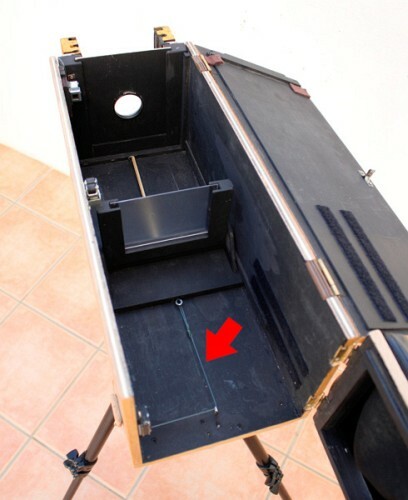 The entire U shaped object sits on a set of hinges to allow easy access and is protected by a similar light trap as we saw on the back system. I started with a design that has one set of slits (one rail) and advanced to a system that has multiple sets of rails if I wanted to add a filter in addition to the shutter/lens. 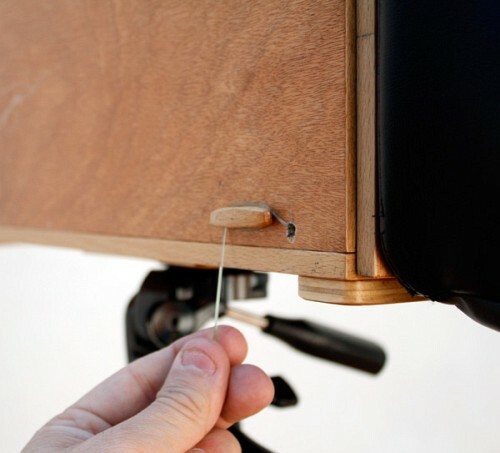 These guides allow you to insert a holder piece (for a lens). And this is how the lens goes in. 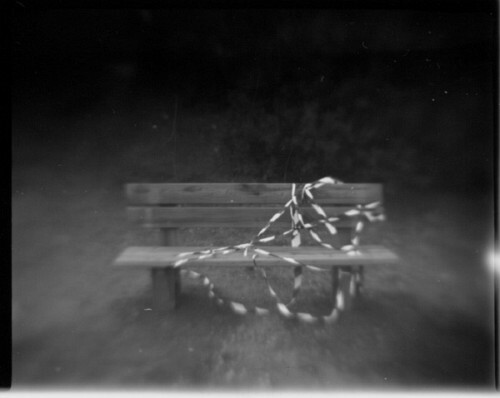 Moving on to a multiple trail system allowed me to add another shutter, an ND filter plate. The idea is that added rail piece will be completely modular, so it will sit on top of the existing slit system and “open up” two new slits or rails. 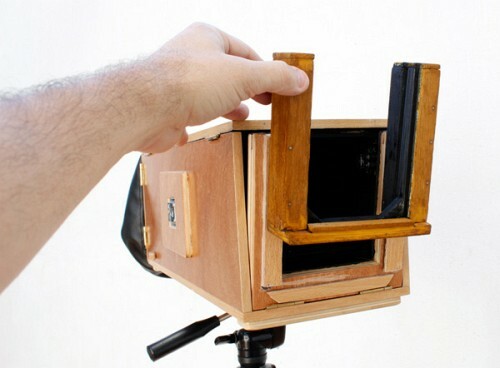 Using a piece of wood as long exposure shutter. I wanted to keep this part simple too. And you really can not get any simpler than magnifying glasses. If you compare a magnifying glass with a “real” lens, you’ll probably see that magnifying glasses are far less “accurate” in terms of optics, but it is not accurate that we are going after here. So off to the Dollar store I went, and came back with a bunch of lenses. The cheapest for about 60 euro-cents and the most expensive one for about an Euro fifty. Nice! Next, I needed to measure the focal lengths and aperture for all those new lenses I got. Of course, another way that magnifying glasses differ from Canon or Nikon glass is the lack of Focal length and aperture marking, so here is a little trick on how to calculate those yourself. The aperture is the focal length divided by the diameter of the lens. 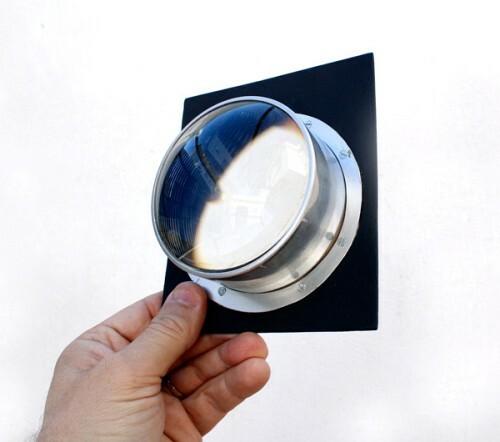 act like you are a kid and try to burn a hole in a piece wood using a magnifying lens and the light of the sun (which for all intents and purposes is parallel light). Got a nice dot of light? great! 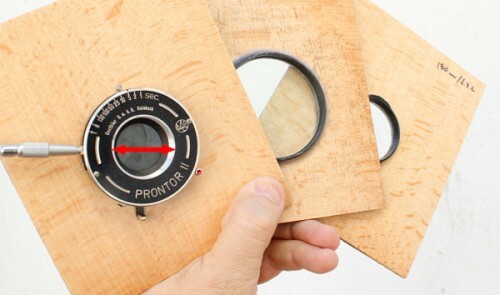 measure the distance between the lens and the dot. 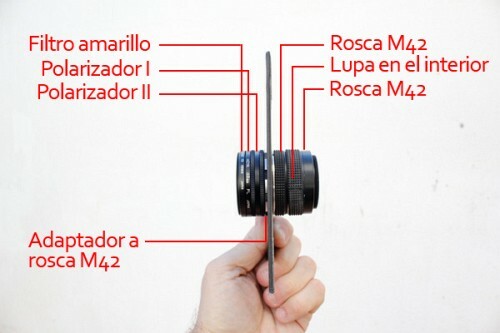 This is your focal length. Now that you know your focal length, divide it by the diameter of the glass. TADA! you have your aperture and focal length calculated. My first two lenses from that experiment were a 195mm F/3.2 and a 130mm F/3.2. See if you can figure out which one is a bigger glass. since our “film” is kinda big, and since we have no “in-lens” compensation, the image will be sharp at the center and will get softer as we move away towards the edge of the picture. And now all the lenses go on wooden boards. 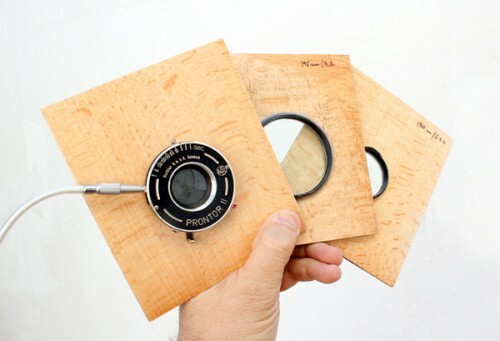 wooden boards with lenses and mechanical shutter. With depth of field so shallow, focus had to be as accurate as possible. 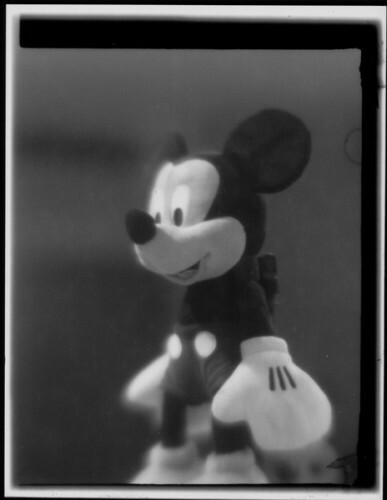 To get the focus right, I used a focusing screen, which is just a fancy word for translucent piece of plastic. The next challenge was finding a way that allowed the focusing screen to move. (no point in having a focusing screen that can not focus). 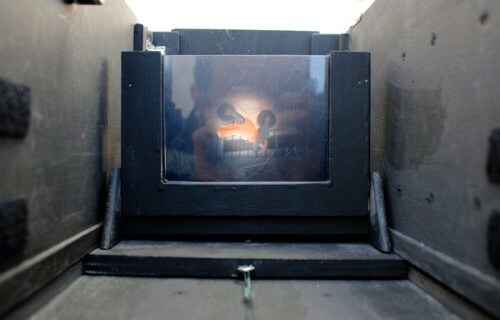 Focusing screen mounted on support. 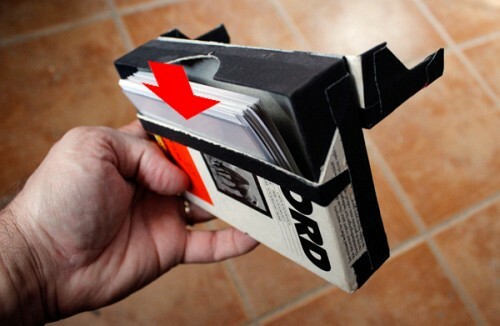 The bottom is hinged, so it can fold, a bit about this in a second. 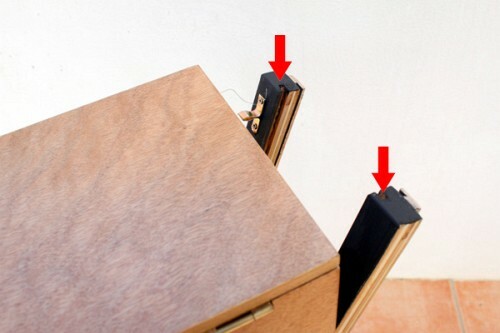 Two small springs (one on each side) to hold the screen in place. 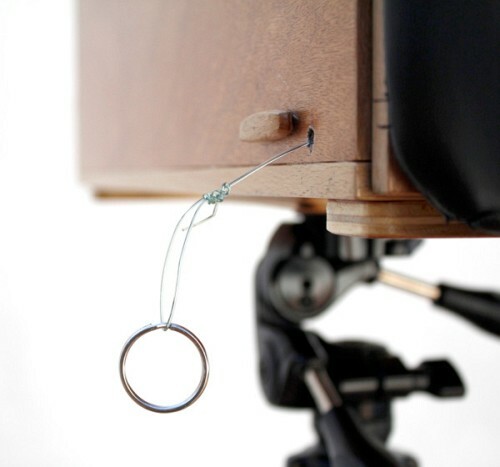 The screen is controlled by a rubber band and a fishing line. The band keeps pulling the screen towards the lens and a fishing line enable pulling it in the opposite direction. 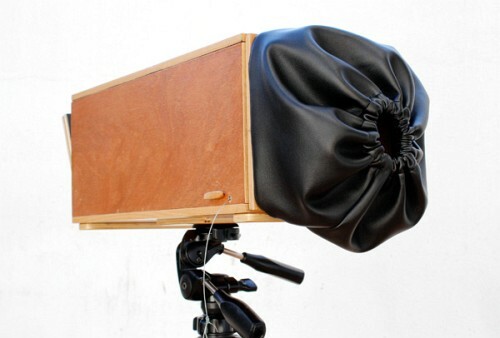 A pair of guides is used to keep the screen in place. 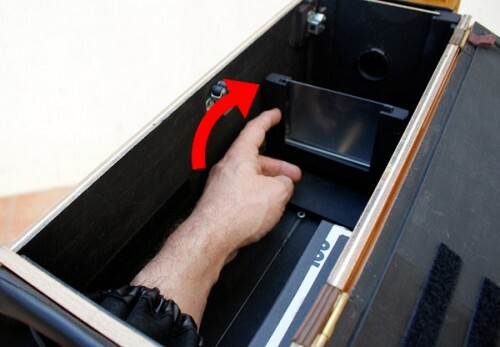 Using the fishing line you can pull and push the screen and once it get to the right position, the line is anchored outside the camera body. And anchored to place once the desired focus is set. 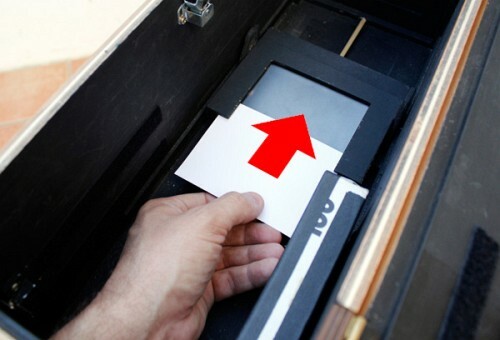 Here is how it looks like with a focused image. 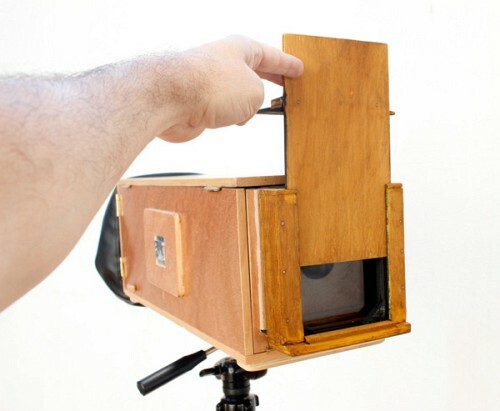 The camera takes the “regular” 9×12 photo paper or a similar sized film sheet. I’ve used it with paper so far, as I love the wonderful imperfect results I’ve been getting. 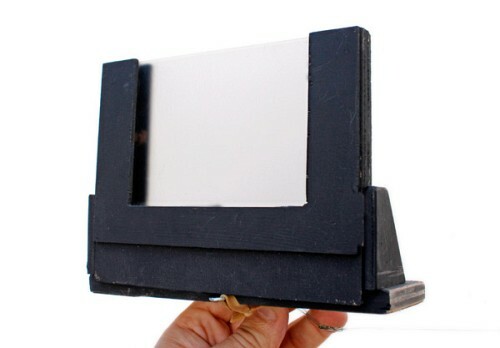 As I said before, the focusing screen is hinged, so it folds backwards and allows me to get photo paper between the mount and the screen/ (if you recall, there are springs there to apply pressure on the paper so it stays flat and in place). 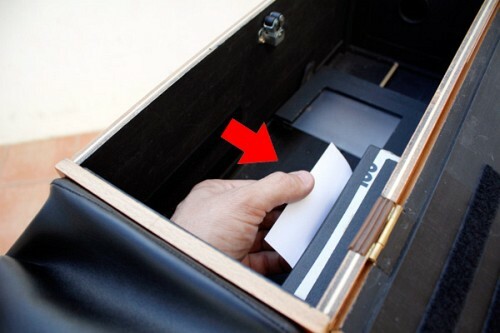 Virgin papers are stored in a light tight box inside the camera. 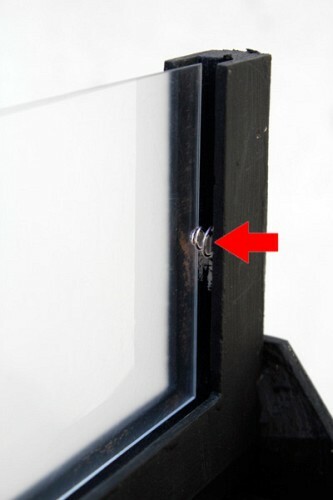 Closing the external door so not light comes in. 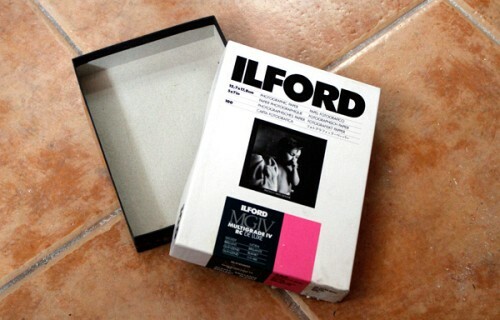 The box is a modified Ilford box, paper box which is modified to be fully light tight. It holds about 50 sheets of paper. 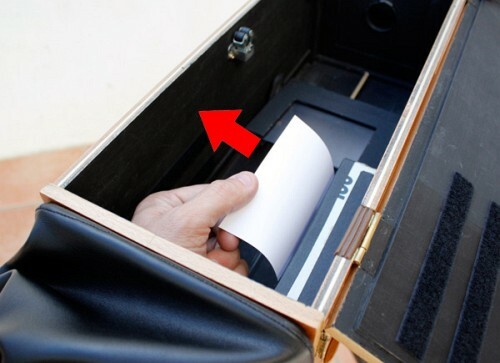 The box is protected with a hinged lid that falls on its weight once left untouched. 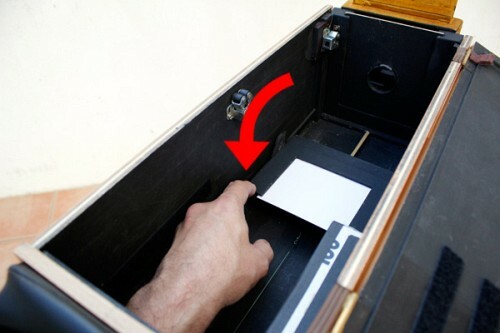 This is important to avoid exposing the paper by accident. 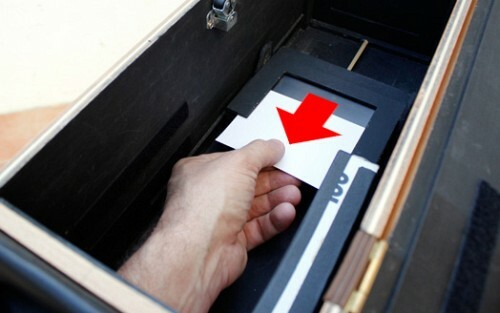 modified box. When you make one, make sure it is light proof. Here comes the virgin trick. 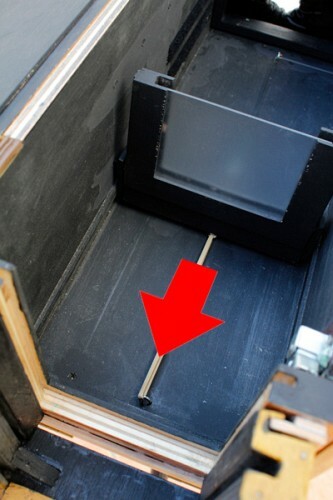 The box is attached to the interiors with Velcro. 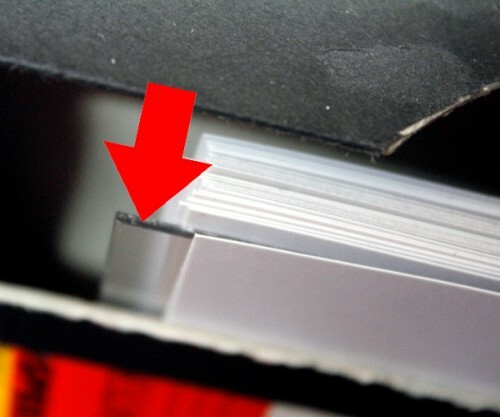 the sensitive side of the paper facing inwards. 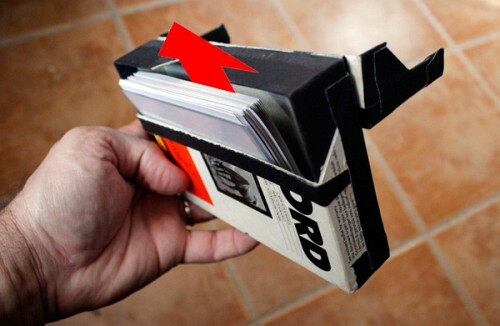 Virgin paper is always (ALWAYS) taken from the inside and placed on the outside after the exposure. 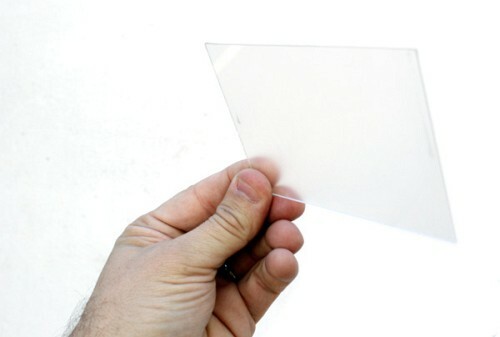 A plastic sheet indicated when a full cycle was made. OK, you made it! if you got so far, you must wanna know what taking images on this baby looks like. Well here it is. 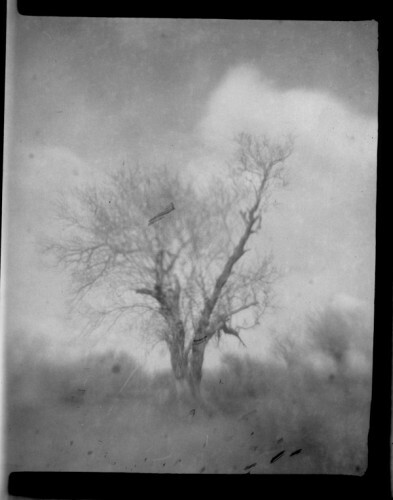 In essence, I expose photographic paper (which is rated at about ISO 3 to ISO 25, depending on how “fine” the paper is). 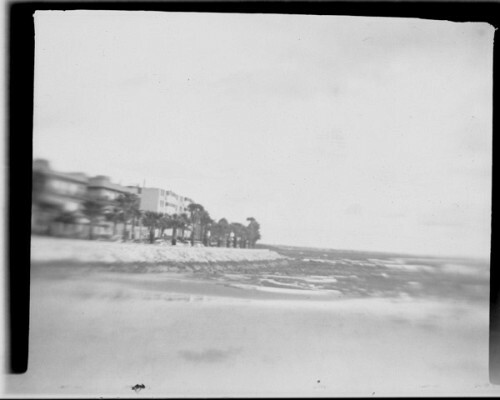 The way photographic paper is usually used is to print negatives, that means that it inverts whatever exposure it receives (remember, negative turn into positives on paper :). S photos taken on paper with this camera need to be scanned and inverted. 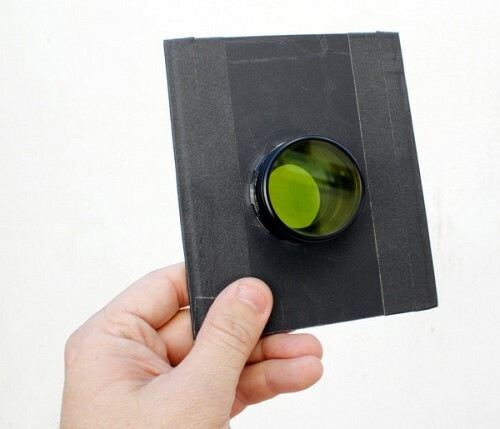 Having calculated the “lens” aperture and knowing the ISO of the paper, I can calculate the exposure time using a hand held meter. Average tungsten lighting, for example requires an exposure of 16 seconds. 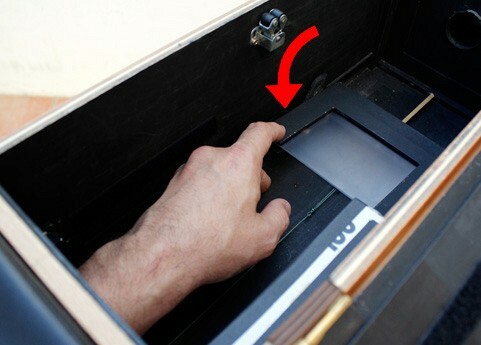 That can easily be handled with the “manual shutter” i.e. a piece of wood. Shooting outdoors is a different thing altogether. For one, the paper is has different sensitivities to different colors, and is Especially sensitive to blue. that comes into play when doing short exposures. Greens on the other hand are almost gone when shooting in shadows. My solution is to use a yellow filter, it darkens the blue and emphasizes the green. Shot with yellow filter – nice clouds! 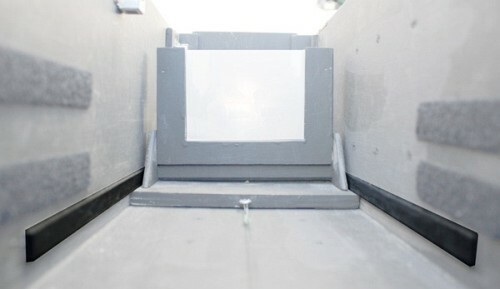 The other hurdle is the need to get short exposures while shooting outside. Anything from 1 second and above, I can handle with the piece of wood. 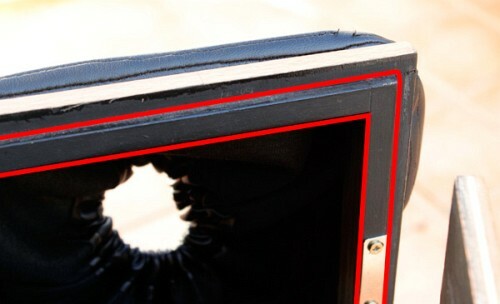 for anything less, I need a mechanical shutter. 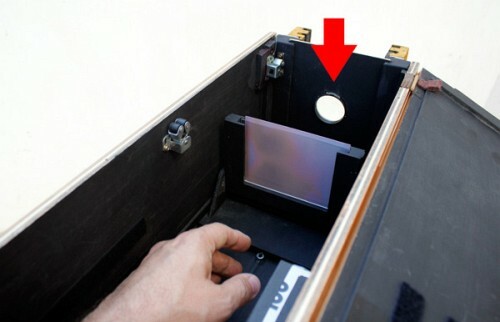 Sadly the shutter is smaller than the lens, and takes away from its aperture. 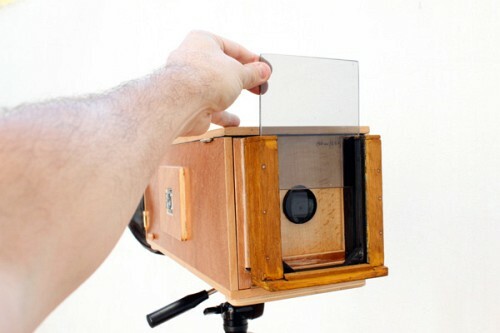 My solution to that is to use two polarizing filters. The nice thing about polarizing filters is that when two of them used, they can act as a varying ND filter. see how it works in the video below. So my out doors lens is no made from a polarizing filter, a yellow filter and another polarizing filter. This is still very much a work in progress, if you have any thoughts, questions or comments, please let me know via the comments. 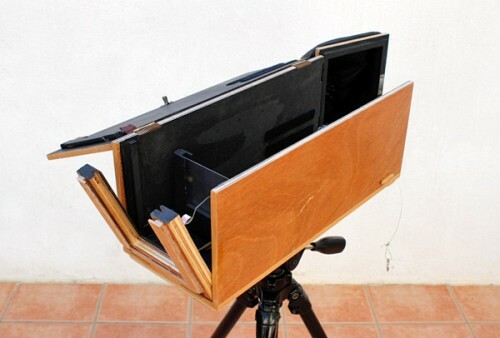 Antonio Montesinos is a photographer and a maker. His motto is shoot, no matter what. You can find more of his work in Spanish over at his blog. Thanks for allowing DIYP to translate this post. 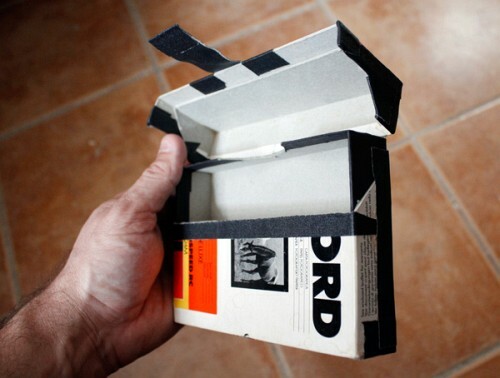 If you can get a hold of a medium or large format camera just load paper into the film holders. If I remember right cutting the paper the right size was easy when I used my 4×5 press camera. I just cut 8×10 paper into four 4×5 pieces. Easy peasy not build necessary.